The UK Government’s recent announcement of a 23 year timeline for action on diesel and petrol cars has drawn comment from Gasrec, a leading supplier of liquefied natural gas (LNG) fuel for road transport in North West Europe. Gasrec implores the government to wake up to the opportunities presented by natural gas that are available right now. Immediate action could be taken within the heavy commercial vehicles sector to improve air quality significantly. According to the government’s own statistics, HGVs and buses account for 34% of roadside NOx emissions created by all local road traffic, only 1% less than all diesel cars. There are currently no commercially viable electric or hydrogen solutions in existence for HGVs and there is unlikely to be one for decades to come. The Government must encourage the use of other readily available fuels in this sector if they are serious about tackling air quality. HGVs are replaced on a much quicker cycle compared to cars, and the UK already has well developed gas infrastructure. Gas vehicles could be deployed quickly, at small cost to the public purse and have a tangible effect on air quality in a matter of years. A recent Policy Exchange report argued that the wider use of gas-based fuels is one of the few options that can rapidly improve air quality. The Government must heed this advice if it wants to achieve meaningful change on air quality across the country. Chief Executive of Gasrec Rob Wood said: “Whilst we welcome the Government’s ambition to address air quality, the timeline for action is too long because public health is at stake. “There is an opportunity to accelerate improvements and make a real difference very quickly through the use of natural gas in the heavy commercial vehicle sector. The Government doesn’t need to penalise consumers but can ask businesses to make a difference, with a solution that is both commercially viable and immediately deployable. The Government’s proposal to consider changes to the HGV road user levy is welcome, but the sector will need clarity before any widespread uptake can take place. “A bridge to a fully electrified road transport system is needed while air quality continues to negatively impact people’s health and lives, and natural gas in the heavy vehicles sector is that bridge. The Government needs to ask itself what route it wishes industry to take to zero emissions on Britain’s roads and in its cities – the continued use of heavily polluting diesel or through the encouragement of the use of natural gas trucks which are demonstrably and significantly less harmful to air quality. Natural gas engines are cleaner and cheaper to operate even than the most advanced diesel ones. They produce 70% less NO2, 90% less particulates and up to 10% less CO2. This level of CO2 reduction is likely to prove conservative as evidence is emerging that diesel trucks and buses produce N2O, a by-product of NOx reduction technologies, that is 300 times more potent than CO2. Although natural gas vehicles sell at a premium to diesel ones today, their operating costs are much lower and are paid back within 24 months. The substitution of natural gas for diesel is now becoming commonplace across the world. In America 23% of buses already run on gas-based fuels delivering cost as well as pollution benefits. In seventy Italian cities, in Madrid where 1,050 buses run on CNG, and in most major French cities natural gas is the fuel of choice for the municipal heavy vehicle sector. Gasrec is the leading supplier of liquefied natural gas (LNG) fuel for road transport in North West Europe. 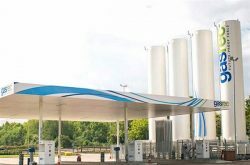 We supply LNG to our network of refuelling stations, where it can also be dispensed as CNG for lighter commercial vehicles, buses and refuse vehicles. We build and manage ‘open-access’ stations as well as dedicated on-site facilities for our customers. We provide advice on the commercial and environmental benefits of natural gas and work closely with manufacturers developing the next generation of environmentally friendly, low emission gas vehicles.